This is the description of the C/C++ API bindings for the Segment Display 4x7 Bricklet. General information and technical specifications for the Segment Display 4x7 Bricklet are summarized in its hardware description. Removes the device object segment_display_4x7 from its IPConnection and destroys it. The device object cannot be used anymore afterwards. Returns the segment, brightness and color data as set by segment_display_4x7_set_segments(). 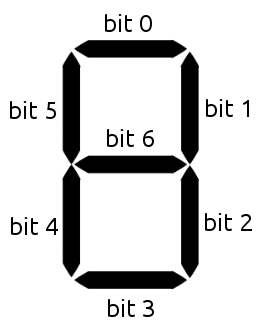 You can stop the counter at every time by calling segment_display_4x7_set_segments(). For getter functions this is enabled by default and cannot be disabled, because those functions will always send a response. For callback configuration functions it is enabled by default too, but can be disabled by segment_display_4x7_set_response_expected(). For setter functions it is disabled by default and can be enabled. See segment_display_4x7_set_response_expected() for the list of function ID defines available for this function. This callback is triggered when the counter (see segment_display_4x7_start_counter()) is finished. The segment_display_4x7_get_identity() function and the IPCON_CALLBACK_ENUMERATE callback of the IP Connection have a device_identifier parameter to specify the Brick's or Bricklet's type.